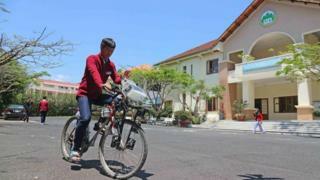 A group of students in Vietnam have invented an air-filtering device for bicycles, to save them having to wear anti-pollution face masks on their journey to school, reports Viet Nam News. The three friends from Thang Long Gifted High School in Da Lat city spent six months on experimentation before finalising the design. The device, which is installed on the handlebar, has an air filter and a battery. The filter uses three layers of cotton and activated carbon fabric to capture the dust. The filter is linked to small fans installed on both sides of the front wheel, which are connected to the existing dynamo on the bike. They blow the clean air into the cyclist's face, as well as charge the battery on which the filter runs. Test results have shown that the device could filter up to 86% of dust and 63% of nitrogen oxide, according to local environmental authorities. Pham Gia Sam, a physics teacher at the school, is confident it's a reliable result that has been reached through many tests at different locations in the city. The student trio who won second prize at this academic year's national technical and scientific competition for high school students, is determined to continue work on improving the gadget in order to maximise its impact. "In the near future, we will manufacture such filters for electric bikes, which would contribute towards protecting people's health and the environment," student Cao Thị Khanh Hoa said. And to keep manufacturing costs low, the students have used recyclable materials. This isn't a new idea. Dutch artist Daan Roosegaarde has been working on a smog-free bicycle for a few years now, as part of a larger environmental project. His prototype, which also sits on the handlebar, inhales polluted air, cleans it using positive ionisation, and releases the purified air back in a cloud around the cyclist. The design was inspired by the manta ray, which filters water for food. Mr Roosegaarde's design firm Studio Roosegaarde has ambitions plans for its smog-free bicycle. It is hoping for a large-scale deployment that could make an impact in polluted cities, and has been working on such plans for a while. The firm told the BBC it's "tuning the right launching date" with ofo - China's leading bike-sharing programme.